Check out from hotel, Morning visit Ganeshpuri - Swami Nityananda’s Samadhi (mausoleum) and then visit Natural Hot Water Springs. Afterwards visit Vajreshwari Temple, proceed to railway station / Airport. (BL) Tour concludes. 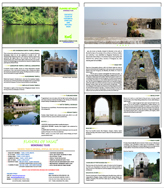 Optional Suggestion: You can extend your stay in Mumbai and enjoy visit to Elephanta Caves also you can extend your stay at Vasai to visit Arnala fort . (folk dance etc. ), camp fire. All sightseeing & transfers by AC car. 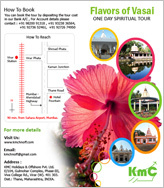 KMC HOLIDAYS & OFFSHORE PVT. LTD. : +91 98200 91318 / 92736 52461.